Poorly constructed roofs have become a real concern in residential South Africa. The Institute for Timber Construction South Africa (ITC-SA) offers insight into legislation governing this aspect of a building as well as guidelines for a correctly built, sound timber roof structure. Arguably one of the most important parts of any home construction, the roof protects the home’s contents, finishes and residents from the elements and is also one of the largest, heaviest and most costly structures in any home design. It is thus fair to expect that a great deal of planning should be invested in the roof’s design and construction for a sound structure that can safely bear the weight of the completed roof as well as offer acceptable longevity and aesthetic appeal. Even so, many choose price over quality when it comes to workmanship and materials, which can have costly and oftentimes devastating implications. 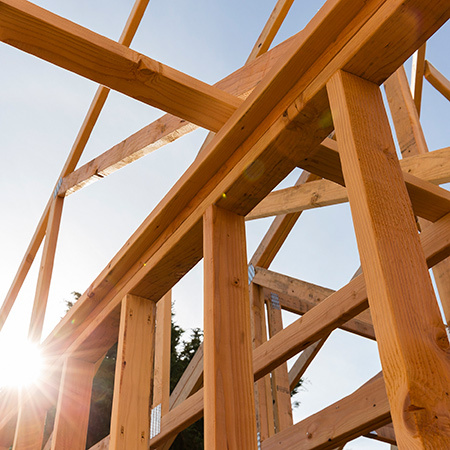 Roof truss designs are assessed in accordance with Part L of the National Building Regulations (SANS 10400) and a national standard that is supposed to be applied by all local authorities when assessing a building plan application. The legal mandate for the National Building Regulations is the National Building Regulations and Building Standards Act (Act 103 of 1977) (NBR). d. the records of inspections and maintenance are kept and made available on request to an inspector. This clearly points out the responsibilities of the owners of buildings and if something untoward should happen and the roof was not inspected in the year, they would be hard pressed to explain why not. That said this does not free the designer, the truss plant and ultimately the system supplier of their moral responsibility in the matter. The ITC-SA makes it easy to source a reputable roof fabricator or engineer; this can be done by contacting the Institute directly or visiting its website at www.itc-sa.co.za. It has a comprehensive list of all the truss manufacturers across the country, noting the engineering systems each fabricator uses, so that any preferential requirements can be assessed. Each truss manufacturer is also categorized in accordance with complexity ratings. All ITC-SA-approved fabricators are audited on an annual basis, and are assessed according to quality, competence and compliance to the South African National Standards, SANS 10243. Should the audit be successful, an annual Certificate of Competence is issued to confirm that the fabricator complies with the National Standards and has been audited by the ITC-SA. 1. The timber used must be structural timber and comply with the design intent (SATAS or SABS marked): Structural timber needs to be marked with red ink on the face of the timber at 1m intervals. If it does not bear these structural markings, it will be condemned. One should beware of unmarked timber, as this is not structurally graded timber. 2. The designer must create an accurate cutting bill: The cutting bill will dictate the exact lengths and angles at which the timber must be cut for proper assembly. 3. ITC-SA accredited System Suppliers must be used: The metal connector plates used must be supplied by the specific engineering system that is being used. In addition, these plates must be the correct size, and positioned in the right locations as per the standard methods and tolerances. 4. All connections and bracing details must be in accordance with the design intent: In other words, everything that holds the structure together, such as the number of nails, bolts, washers, brackets and cleats, must be in accordance with the engineering design. All necessary bracing accessories must be stipulated on the design plans. The old adage of what you pay for is what you get could never be truer than when it comes to roof construction. Many people try to save on the roof construction and often end up spending more remedying the problems that arise from using sub-standard materials and workmanship. Bear in mind that in order to create a professional and sound end result, it is imperative to employ the know-how of professional, knowledgeable and experienced individuals, whose expertise will no doubt cost more initially than non-qualified individuals off the street, but will save a great deal of money and stress down the line. It is important to use a qualified structural engineer to design and sign off the roof and to ensure that the chosen engineer has good working knowledge of timber and roof construction. Prefabricated roof trusses are cut by advanced, specially designed machinery and are therefore far more accurate than their hand-made counterparts. Handmade trusses assembled on site are a recipe for disaster. Prefabricated trusses also use less timber and are more likely to comply with NBR requirements if they are designed by a qualified engineer. Using reputable fabricators, such as those registered with the ITC-SA, offers peace of mind that these companies or individuals are regularly audited and monitored, and that should something go wrong with their workmanship, there is some kind of recourse. Part of the membership requirements for engineers accredited by the ITC-SA is that they all carry their own personal indemnity insurance policy which will cover any negligence on their part with regards to the specific structures they sign off on and take responsibility for. For more information, visit www.itc-sa.org.